Full list. 225 DVD threshold, 178 BD. 3 6 11 2,355 53,001 6 Youkai Watch Movie 2: Enma Daiou to Itsutsu no Monogatari da Nyan! 93 119 185 62,664 77 Girls und Panzer Kore ga Hontou no Anzio-sen Desu! 99 136 179 6,280 6 Youkai Watch Movie 2: Enma Daiou to Itsutsu no Monogatari da Nyan! Delta v1 adds 197 BDs, total 13,116. Re:Zero v1 adds 264 BDs, total 10,938.
v2 adds 505/117, total 9,539. DVDs from per-series ranking. Odds of this volume crossing 10k as well look good. Joker Game v1 adds 198 BDs, total 8,909. Jojo Pt4 v2 adds 188 BDs, total 8,480. Koyomimonogatari adds 190 BDs, total 31,355. One-shot so that’s also the average. Konosuba v5, final volume, adds 206 BDs, total 9,855. Series average: 10,822. Osomatsu-san v7 adds 508/705, total 43,020. Garupan Movie adds 557 BDs, total 222,103 in wk12. OVA adds 185 BDs, total 66,650 in wk77. Kizumonogatari adds 1032/213 BDs, 354 DVDs, total 47,023. High Speed adds 259 LE BDs, total 29,123. Persona 3 Movie 4 adds 1435/344, total 21,724. I saw it within the top 100-150 the entire last week so yeah it’s very likely that it makes at least another 100. Nevertheless we seem to be in some kind of a break at the moment. Volume 1&2 should get another small boost with the release of volume 3 soon. I expect it’ll make the top 100 full list given what a slow week this is. I wouldn’t be surprised if it were as high as another 250 BDs. 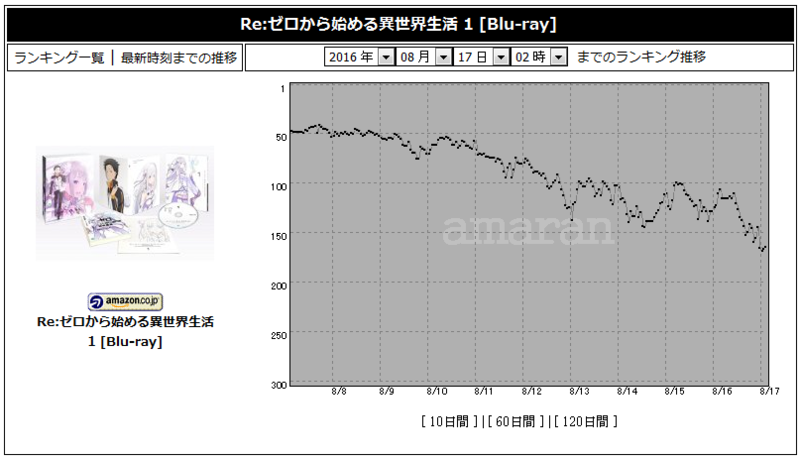 Re:Zero’s v2 had stock issues the whole week. Hopefully they resolve this for volume 3. Oh they still have stock issues for volume 2? That’s really disappointing considering that they could’ve used the momentum and sold a bunch more. Well this is a slightly bigger wk3 than v1 got so I guess they’re not -as- bad this volume. What is it “stock issues”? The production and the distribution to different stores and online retailers can’t keep up with the demand which means that people who would’ve bought the BD/DVD simply can’t. From a source material reader’s standpoint who looked a lot into the history of this entire series I can tell you that there are multiple reasons on why there will be very likely more content. Hell the fact that a story of this caliber ( length-wise ) got an adaptation at all is already a reason in itself. An adaptation that advertises merely the first 10% of the story is not nearly enough to get everything out of this entire series. The fact that they started this, makes it very likely that there will be multiple “waves” of advertisement. Anyway, an original ending is pretty much confirmed to not take place. Can you give the current estimation for New Game and Mob Psycho vol 1? Standard disclaimer: 41 days is a long time and those numbers could go up or down considerably. And both volumes will have some degree of event ticket boost. I guess. Not really a fan of this “averaging maybe 3.5k is surprisingly good” world though. Mob Psycho probably is underestimated like Stray Dogs vol 1 as Fujoshi buying Series usually are. But I really want New Game to succeed. It’s the best sol since Gochiusa season 2. I hope It at least sell 6k-7k. I’m a bit curious did Macross Delta sell below 300??? This week I didn’t see it on the list and I’m worried this series won’t be selling as well as Frontier did. We already know it won’t be selling remotely as well as Frontier, so there’s no question about that. Frontier averaged 46,297. Delta will be lucky to average more than 10-11k. As for this week, it would be Delta’s fourth week. It’s not really unusual for a disc that’s sold ~13k and was front-loaded to sell less than 300 BDs in its fourth week. It probably added another 200-some, and might rank once or twice more if it gets a bump with the release of v2. Overall sales have been in a gradual (albeit maybe accelerating) decline since about 2008. Since then year on year sales have only gone up twice: very slightly in 2010, and a big bump in 2013. Though that’s for the JVA’s “domestic animation for the general public” category in general, and it’s hard to tease out just the late night stuff we track here, for which we only have the incomplete Oricon reports. So as far as median and average sales go, 2016 just continues the trend… but yes, what’s really sticking out is the paucity of huge hits, or even 10-15k sellers. That I can’t explain. We’ll have two mega-hits, but both will be sequels to huge idol franchises, so there ain’t much variety at the top. Koyomimonogatari has passed 30k but given it’s Monogatari and it’s a one-shot release that’s not exactly turning the year around. We should also snag another sequel 10k with more Haikyuu, unless its drop is even worse this time. Delta should do it too, but if its event ticket drop is really harsh, even it might miss. There’s a Nanoha series coming in Fall but that franchise is cursed and long, long past its peak. But you need more than sequels and long-running franchises selling 10k, else what will be the sequel 10ks in the coming years? So far this year the only one is Konosuba. Re:Zero has an outside shot, but being 9 volumes makes it rough. B Project should have an easy 10k v1 but that’s going to be largely event ticket driven and won’t hold up for the final average. We might have to place a lot of hope in Touken Ranbu becoming a mega-hit with women, though it has to compete with Utapri and Haikyuu in the same season. And this first of the two Tourabu adaptations is the more comedic one. The serious series comes next year. I’m not sure which fans will like better. I can’t see more than 8 10ks this year even at an optimistic estimate: Koyomi, Konosuba, Delta, Rezero, LLS, Utapri4, Haikyuu3, Tourabu. 5 ongoing franchises, 3 sequels. And some of those are questionable. Anything beyond those would be considered a dark horse at this point. And while we should usually expect a dark horse, uh, this year isn’t inspiring that kind of confidence. We need a surprise megahit original for male otaku. That looks -pretty- unlikely this year, but then if it were likely it wouldn’t be a surprise I suppose! Do you know how Tsukiuta is doing? It was funded by Animate as part of their 30th anniversary, one episode has the main cast work at an Animate store and promote merchandising that is being sold in real life. The only places selling the BD/DVDs are their store and movic, Amazon and other stores aren’t selling it as far as I know. It has been ranking at Animate, not as high as Utapri 5th stage or Love Live Sunshine, and unlike the other idol projects aimed at women they don’t have a heroine/self-insert, next episode featuring the female idols of the franchise. With it being Animate only, there’s no way to tell. Like yeah it ranking at Animate is good, but less meaningful than with normal releases because its Animate ranking should by definition be inflated as that’s the only place to get it. It may not matter however, because there’s a real chance it’ll never get reported by Oricon. Animate does report to Oricon, but that only matters if the disc is in Oricon’s database. And right now a search for ツキウタ on Oricon’s public site doesn’t list the volumes at all (just a live event disc). This is similar to Diabolik Lovers’ first season, which was also Animate only (for LE anyway) and never got into Oricon’s database and thus was never reported. A search for DIABOLIK LOVERS on Oricon only brings up the REs, a DVD box, a stage event, and the sequel (which -was not- an Animate exclusive, and thus reported by Oricon). Based on this I would expect Tsukiuta’s sales to never get reported, unfortunately, regardless of whether it sells well or not. I’m aware Walkure’s Album is selling pretty well but as for Disc sales it’s seems the opposite around, is there a reason why the first volume sold below 13k. Most of the fans of the series had high expectations on the show, are Japanese fans not satisfied with it? Could there be a miracle and volume 2 boost Delta chances of reaching at least 20k or as you said in one of your post above the event ticket that’s being held could that help? Vol 1 already had the event ticket, so it won’t help Vol 2. A v2 never sells more than a v1 unless 1) v1 was massively understocked and never got fully restocked (Garupan) or 2) v2 comes with some bonus and v1 did not, or v2 has a better bonus. Neither is the case for Delta. I see the best case scenario for Delta being 11k average. It could be 9-10k depending on how big the ticket drop is. This isn’t -bad-, but it’s very much not in the same realm as Frontier. If Delta had not also included an event ticket with the CD and only put it in the BD, v1 likely would have sold much more. It’s questionable whether that would have generated more overall revenue than their CD+BD approach, however. The first Macross OP/ED CD had a mini-live ticket (different from the album/BD1 live) but the 2nd OP/ED CD has no event ticket and as such had much lower CD sales so I fear there will be a noticeable drop in ticket-less BD sales V2 onward. But 111K and still climbing CD sales for the album are good. The margins might be better on CDs and don’t forget those who ‘win’ the concert lottery have to buy the actual concert tickets as well and will probably buy light sticks, t-shirts, etc. You can buy concert merch beforehand or even if you don’t end up going. If they can add a second concert ticket for the 9th BD that might help the BD average a little but overall the franchise is such a merch machine (plastic models, figures, dakimakura, etc.) that I’m sure it is making money even with lower BD sales than earlier series. Overall it is probably still making less than the earlier series in the franchise but jeez, it’s over 30 years old. I think it’s held up pretty well, given it’s age and the gaps between the series. Monogatari, another successful long runner has lost so much in just 7 years from 80K down to under 30K. 50K to 10K would be striking for Macross but still good considering all other factors. • It’s possible some of this is DVD v1wk7 but that would be such a tiny amount. • Gave it to DVD because DVD ranked to wk4 while BD only ranked to wk2. Again, doesn’t really matter which I give it to though. rezero despite all the hype and being talk alot everywhere seems it is still struggle to sold as good as Overlord, that didn’t get the same response as rezero, curious how the other volumes will do. Joker Game is my last bright spot for both Spring and this upcoming dead Summer seasons when most of my faves are going to flop. also nice to see re:zero vol.1 for 8th week !! What are the current estimates for Love Live Sunshine? 48.1K Vol.1 estimate, which is not as good as the 59K estimate, Love Live S2 Vol.1 had (82.5K week 1 in reality due to Love Live always having strong storefront performace at Animate, gamers, etc). Aqours is not Muse, so they’re expected to not do as well, so early after their debut in 2015. Even the creators don’t expect much so early, as their first live is in a small venue (only 12000 cPacity each over 2 days). I know there were some fans on reddit debating whether they were pushing Sunshine out too soon. Muse was introduced in Dengeki G’s in mid-2010, and the first season of the anime didn’t come out until early 2013, so they had about 2.5 years to build up their song library and introduce people to the characters and performers through magazine articles, CD singles, manga, Radio CDs, and concerts (the first live concert was held in 2012) before the anime came out. Aquors was only introduced just over a year ago, and for the majority of that time Muse was still active and commanding the lion’s share of the attention – they’ve really only had the spotlight to themselves for about six months now, and haven’t had nearly as much buildup – just a few articles and a handful of singles. In fairness they probably don’t need quite as much time, since the Love Live brand name is established now, but it still feels like we hardly knew them when Sunshine premiered, compared to how much more material was out there for the original group.